Are you buffered from Internet baddies? Buffered, a Hungarian VPN service provider, wants to protect you from Internet baddies such as identity thieves and government surveillance agencies. By connecting to a VPN, all your Internet traffic is encrypted and rerouted through a VPN server before continuing on, with a new IP address, to the intended destination. Because of the strong encryption and the masquerading of IP addresses, your privacy and anonymity are protected. While security is the number 1 reason for having a VPN, it is not the only one. A VPN can be used to break geo-blocking which is a form of Internet censorship. Specifically, access to some websites are restricted based on the requester's geo-location. For example, access is only granted if the requester resides in the same country as the website. To break this form of censorship, you would connect to a VPN server located in the target country. Below, we review the Buffered VPN service. 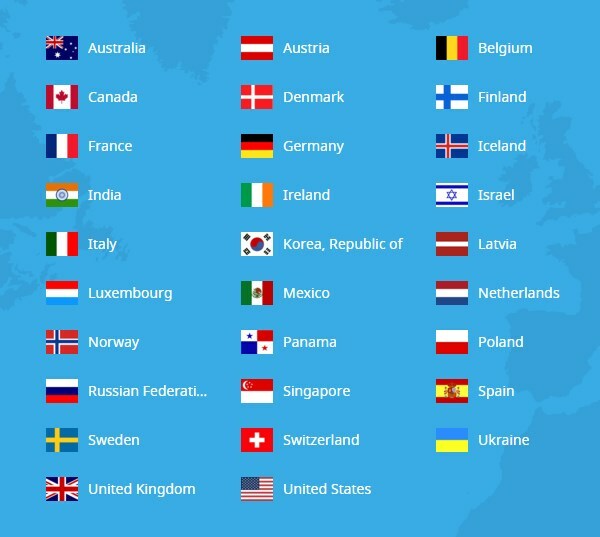 Buffered operates a global network of VPN servers in 36 countries. This network is small relative to its competitors who may have servers deployed in 150+ countries. The country count is potentially important for subscribers who are mainly interested in breaking web censorship. Such potential subscribers should consult the country list to make sure Buffered has the right countries for them. When a VPN vendor deploys a server in a foreign country, it establishes a presence there, and hence is subject to the enforcement of that country's privacy regulations. Legal enforcement may include the physical confiscation of server hardware in order to access subscriber logs. As a counteracting measure, VPN vendors (including Buffered) adopt a no-logging policy. If they do not keep activity logs, seizing the physical hardware is useless for identifying subscribers and correlating their online activities. In response, some countries have passed regulations to force VPN vendors with a server presence to keep detailed logs of subscriber Internet activities. Russia is an interesting case in question. Several reputable VPN vendors, including Hide.me and IPVanish, have recently shied away from Russia because of a new law that requires all VPN vendors, domestic and international, with a presence in Russia to keep logs of subscriber Internet activities. Buffered, despite its no-logging policy, still maintains its Russian presence. The rationale, according to their website, is that they are 'based outside of Russia, and therefore do not have to comply with Russian law.' Furthermore, it adds, 'if past history is anything to go by, the Russian state does not have the capacity nor the resources to enforce the law.' Buyer beware. Besides security, a VPN vendor should also be evaluated by its bandwidth policy. Specifically, whether it places any restriction on bandwidth usage. Many BitTorrent users are drawn to VPN because file-sharing, a bandwidth-intensive activity, is often curtailed by their Internet Service Providers (ISPs). If you are not using VPN, your ISP can track your Internet activities and may decide to throttle your file-sharing bandwidth. A VPN can hide your activities from the ISP by rerouting your Internet traffic within the encrypted VPN tunnel. However, many VPN vendors only support file-sharing on a subset of their VPN servers. There are many possible reasons: e.g., the varying cost of bandwidth among countries, and the licensing terms between the VPN vendor and third-party datacenters. 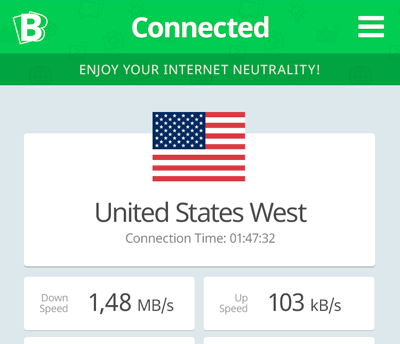 Buffered supports file-sharing on all its VPN servers. Furthermore, it offers unlimited and un-throttled bandwidth for file-sharing activities. Gone are the days when desktop and laptop computers were the only devices we used to connect to the Internet. Today, we have mobile devices such as smartphones and tablets. More and more Internet-enabled network appliances are entering the market, e.g, smartTVs, media players, fitness trackers, etc. To evaluate a VPN vendor like Buffered, we must examine its strategy for protecting this vast array of devices, and how easy it is to set up VPN access on these devices. Buffered provides client apps for Windows, MacOS, and Linux desktops and laptops. While Windows and MacOS support are standard in the industry, very few VPN vendors offer a Linux client app. Online instructions are available on how to download and install these apps. 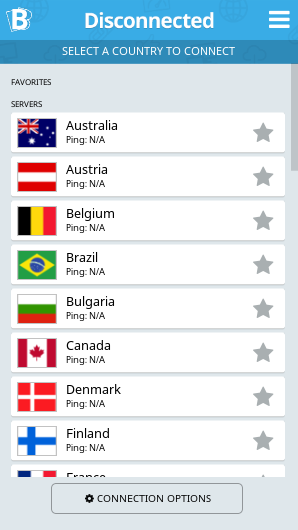 Running the app on a client device enables you to select a VPN server for immediate connection. Many VPN vendors also provide apps for your iOS and Android mobile devices. Buffered does not. Instead, it provides online instructions on how to manually set up VPN on those devices. 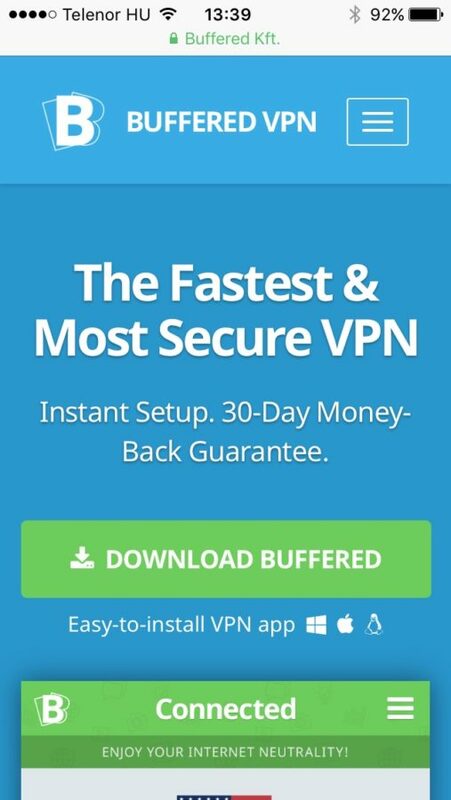 By default, Buffered uses OpenVPN, the best-of-class VPN protocol known for being the most secure and the fastest. Unfortunately, both iOS and Android do not have native OpenVPN support. The manual setup involves installing a third-party OpenVPN connection client on the mobile device. To protect your network appliances such as Apple TV, the best way is to configure OpenVPN on your Internet router, assuming that it is OpenVPN compatible. In this way, all devices connected to the router are protected by the VPN. Buffered allows a maximum of 5 devices to connect simultaneously to the VPN. The router counts as 1 device, regardless of how many devices are connecting via it. So, a VPN-enabled router is the legitimate way to circumvent the 5-device connection limit. You can manually configure a compatible router to support OpenVPN. Detailed instructions are given on the Buffered website. Alternatively, you can purchase a pre-configured router that is Buffered VPN-ready. Purchasing a pre-configured router will cost you more, but it will save you time and possibly a headache from trying to do it yourself. A VPN can only protect you if you are connected to it. It is not improbable that a VPN connection will drop in the middle of a session, for example, during a lengthy download of a torrent file. When the VPN connection drops, your privacy and anonymity are no longer protected. Many VPN vendors provide a kill switch that you can enable and disable using the VPN client app. If the kill switch is enabled, all Internet connections are terminated immediately when the VPN connection drops. As a result, no Internet traffic ever gets leaked into your regular non-secure Internet connection. Buffered VPN does not currently support the kill switch feature. Shoppers for VPN service love a free trial. Yet, they won't get one from Buffered. In lieu of a free trial, Buffered offers a 30-day money-back guarantee which is as long as you will ever find in the VPN industry. The idea is that you can sign up for a paid subscription plan and try the service out. If you don't like the service, you can always ask for a refund within the 30-day period. A generous money-back guarantee, however, is no perfect substitute for a free trial, from the perspective of the subscriber. First, you need to disclose your credit card number or PayPal ID in order to set up a payment method. Not everyone is comfortable in giving out that information if the purpose is simply to try out the service. Second, the money-back guarantee is conditional on the subscriber not exceeding some usage thresholds. Specifically, you cannot log on for more than 100 sessions, use the VPN for more than 10 hours, and transfer more than 10 GB of data within the 30-day period. Buffered follows the industry norm in how it prices its services. Subscribers can select 1 of several plans based on duration of contract. The longer the contract, the cheaper the rate. Their longest plan is for 12 months, and is priced at $8.25 (USD) per month. This price is approximately 20% higher than the competition. As mentioned above, Buffered accepts the major credit cards and PayPal for payment purposes. Both methods support recurring payments, aka auto renewal. Unless you inform Buffered otherwise, your account will automatically be renewed (and charged) at the end of the contract period. The convenience this feature offers is undeniable, but it comes with a security risk. Specifically, your personal information in the form of your credit card number or PayPal ID needs to be kept for a prolonged period of time. Noticeably absent from the list of supported payment methods is Bitcoin. Bitcoin is arguably the second best payment method with respect to anonymity protection (with cash being the best). You can anonymously buy bitcoins and make payments. The disadvantage with using Bitcoin is that it does not support recurring payments. Some VPN vendors give subscribers a choice: they can opt for Bitcoin with manual renewal, or non-Bitcoin such as PayPal with auto renewal. Other VPN vendors, including Buffered, simply shun Bitcoin. Finally, support for Buffered VPN is available 7x24 via email. While writing this review, I submitted an email query to their support team, and received a prompt reply. There is no live chat support. Manual VPN setup on iOS and Android.